First impressions: Like a cardinal and gold Hollywood movie trailer promoting a 2019 late August release, the USC Trojans – under producer and director head coach Clay Helton – concluded 15 days of spring practice on Saturday morning inside the Howard Jones/Brian Kennedy Fields open-air soundstage. 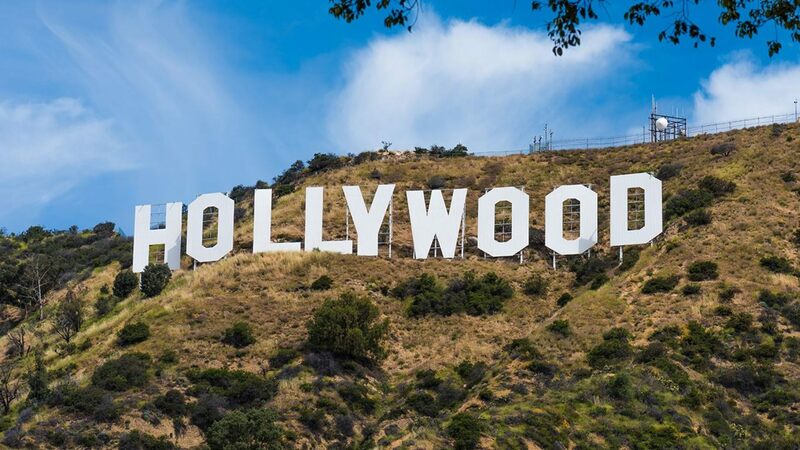 One could conclude that there are budding individual starlets, but this motion picture – or should we say the 2019 USC football team – left the media wondering what kind of team review should be written, creating an unsure evaluation with a lot of guesswork at best. In other words, only playing out the 2019 season will provide the unanswered questions from the now completed spring practice sessions regarding whether this team will earn a Pac-12 championship or an Oscar at the very least. First impressions – offense: With some intense controlled hitting and tackling on Saturday morning, it wouldn’t be going out on a limb by saying the offense figures to be marketable better than last season. Last season, could it have been worse in the second half of games? Enter new offensive coordinator Graham Harrell. Thanks to Harrell, there is a real offensive system now in place, run by its creator (Graham Harrell), and one would hope and think that the final quarterback decision among the four candidates (JT Daniels, Jack Sears, Matt Fink, and Kedon Slovis) would eventually and smartly be made after a couple of scrimmages into training camp in August. As Harrell said this week, 15 spring practice sessions are too short a time to draw a definitive conclusion on a starter, and the young coach isn’t just blowing smoke. Sears had the big highlight of the day on Saturday with a 65-yard TD pass to Tyler Vaughns. 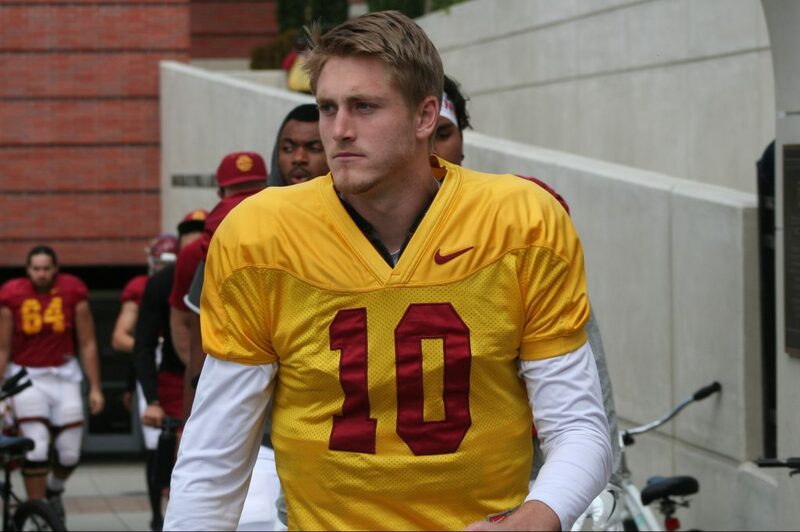 Can sophomore QB Jack Sears, the pride of San Clemente HS, unseat returning starter JT Daniels and become the 2019 starter against Fresno State on August 31 in the renovated Los Angeles Memorial Coliseum or whatever they’re going to call the Grand Old lady? Second impressions – offense: It appears that the Trojans will have a running game to compliment the offensive passing fireworks. On Saturday, all three running backs displayed why each could start on any other Pac-12 team. They’re that good. The offensive line has shown improvement, thanks to a new Air Raid, quick quarterback release scheme. But how much more physical is the O-line going to be in 2019? We really won’t know until this unit matches up with some of the D-line bullies from Stanford, Notre Dame, Utah, and Washington. Although there’s a depth issue at wide receiver, it is safe to say that the quality of receivers Michael Pittman, Tyler Vaughns, Amon-Ra St. Browns, and Devon Williams – perhaps the best unit in the Pac-12 and arguably amongst the top in the nation – are top shelf but will have to be productive and remain healthy while the incoming freshmen class of wide receivers gets their inexperienced feet wet. First impressions – defense: The front seven looks formidable – especially that front four that flexed its muscles during the final day of spring ball on Saturday – thanks to some changes in schemes and position switches. The “front four” has potential to be very disruptive to opposition offenses, and the emergence of true freshman defensive end Drake Jackson has been a positive revelation. Add the position changes of sophomore Palaie Gaoteote from inside linebacker to outside linebacker and the switches of outside linebackers Jordan Iosefa and Kana’i Mauga to inside linebackers could have a major positive impact. The jury is still out whether senior inside linebacker John Houston Jr, a marvelous athlete, is physical enough to withstand a physical offensive line onslaught. Second impressions – defense: However, that proverbial defensive elephant in the room remains the inexperienced secondary, especially at the corner positions. There is talent there but woeful inexperience. 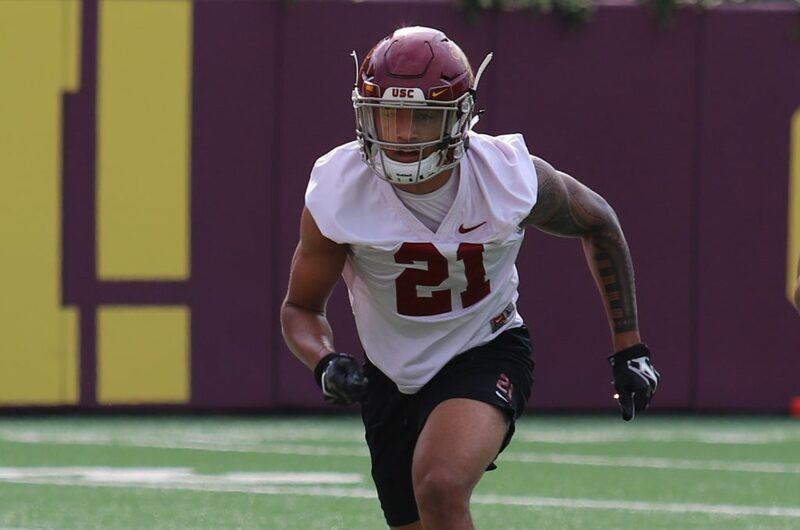 It appears that sophomore safeties, Isaiah Pola-Mao and Talanoa Hufanga, will get the nod and are talented and physical enough if healthy. It’s safe to assume that the corner spots will still be up for grabs well into training camp. There will be no issue of depth at the corners when training camp rolls around, but there are big issues when it comes to its inexperience and youth. Sophomore Isaiah Pola-Mao (6-4, 200) looks to continue his drive for a starting safety spot in 2019. Isaiah is the nephew of former Trojans’ two-time All-America safety Troy Polamalu. First impressions – special teams: While special teams didn’t receive the spring attention of the offense and defense, there is a promising future with the booming punting of redshirt freshman Ben Griffiths, the kickoff power of Alex Stadthaus, and the placekicking of Michael Brown. Of the three kickers, the placekicking competition will deserve more scrutiny come training camp when former placekicking starter Chase McGrath, a sophomore, is expected to challenge Brown after spending time rehabbing from last year’s knee surgery. Testing discipline: Clay Helton and his staff have legitimately worked hard to instill discipline into the 2019 Trojans. Last season, the Trojans were sorely lacking in discipline and that contributed to a 5-7 record and no bowl game. Helton’s new discipline was strongly tested on Saturday when during a “live” period, senior wide receiver Michael Pittman and true freshman Briton Allen got into it. Much to his credit, Gentleman Clay stopped practice, gathered the team around him, and used very colorful language to get his point across that the 2018 season can’t transcend into the 2019 season. One of Helton’s biggest challenges is to get the 2018 undisciplined Trojans to become the disciplined 2019 Trojans. 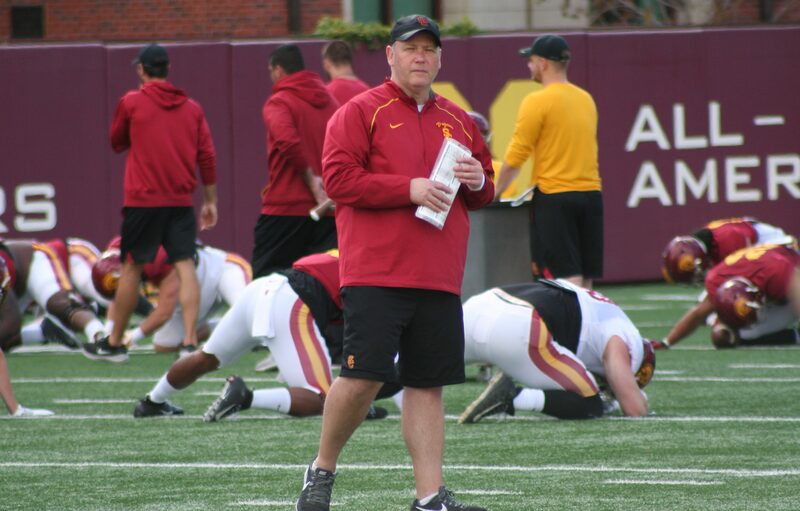 Bottom line: While we’ll go further into depth of analyzation in the near future, but the 2019 Trojans have an improved coaching staff and probably got as much done as they could have given 15 spring practices ushering in a new offensive system and a simplified defensive system. 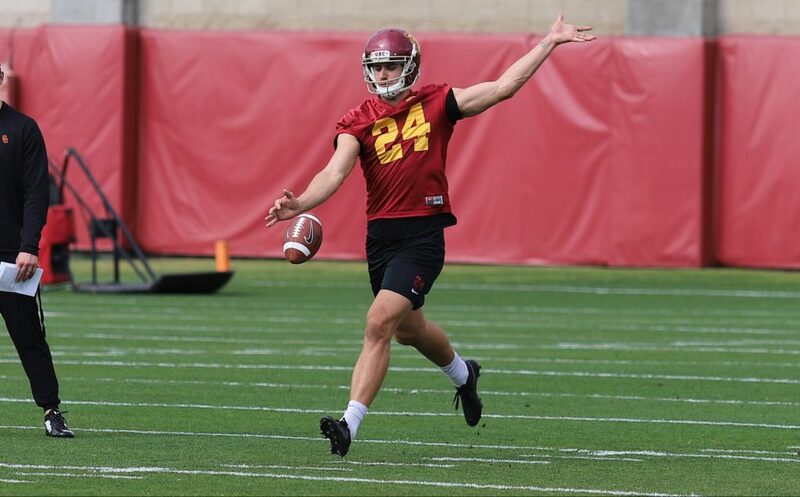 Big Foot: Although he has not punted in a college football game, redshirt 27-year-old freshman punter Ben Griffiths (6-5, 230) is the biggest Trojan punter since Troy Richardson (6-5, 220) booted for them (1983-85). 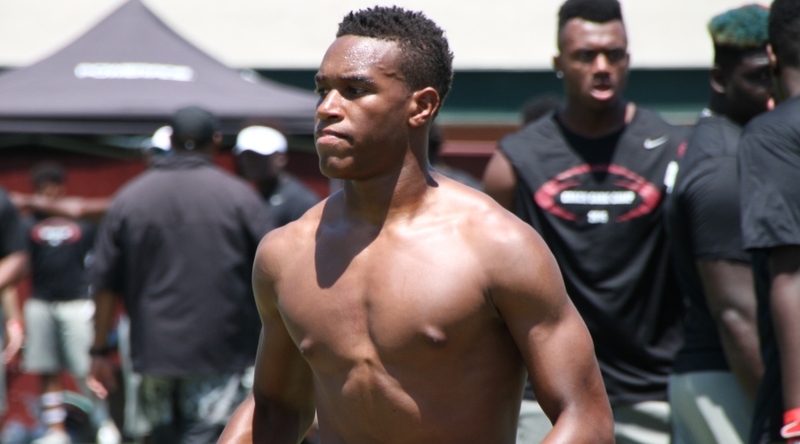 Richardson played his prep ball at Huntington Beach (Calif.) Edison. The challenge: It was a massive campus parking challenge on Saturday with the Trojans’ 10:15 morning practice going head-to-head with the popular and well-attended Los Angeles Times Festival of Books, which was being held on the opposite end of campus. Honestly, parking was a pain in the Bruins. Band of readers: BTW, “Kicking off” this weekend’s Los Angeles Times Festival of Books on Saturday morning was a special guest performance by the Trojans Marching Band. The announcement: Although these things can always be subject to change, it’s being reported that Bellflower (Calif.) St. John Bosco All-World quarterback DJ Uiagalelei, a five-star pro-style quarterback in everybody’s Class of 2020 recruiting book, will be announcing on May 5. It’s also being reported that DJ will select from USC, Oregon, and Clemson. Bobbleheads: Winning certainly is the number one reason for fans to support the Trojans during home games in the Coliseum. However, in this day and age, and using the Dodgers as an example, bobbleheads are certainly a fan favorite and attendance increases on bobblehead giveaways are noticeable. To help attendance, the Trojans marketing department should strongly consider having six “Legendary Trojans” bobblehead games for this upcoming season. Who wouldn’t want a Matt Leinart bobblehead for their sports memorabilia room? Bobbleheads – Part 2: As a cardinal and gold public service, here would be our six bobblehead giveaways for 2019: Fresno State (Charles White), Stanford (Marcus Allen), Utah (Ronnie Lott), Arizona (Sam Darnold), Oregon (Carson Palmer), UCLA (Matt Leinart). 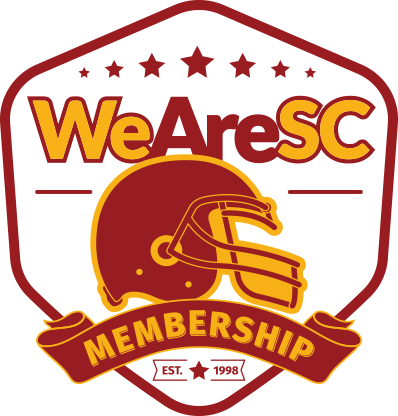 We’re sure you can come up with your own suggestions for six 2019 bobbleheads, so feel free to comment on the Garry P. WeAreSC Huddle message board. The transfer: Trojans’ graduate NCAA Portal Transfer defensive end Oluwole Betiku Jr. announced on Thursday he has committed to Illinois, a university that has former Trojans’ assistant defensive line coach Austin Brown as the Fighting Illini’s defensive line coach. For whatever reasons, Betiku never lived up to his 5-star reputation coming out of Gardena (Calif.) Serra High. For whatever reasons, Betiku could never get over the hump and make a sustained contribution on defense. Coming or going? Junior WR Velus Jones is said to be visiting the University of Tennessee and former Trojans’ wide receiver coach Tee Martin this weekend in Knoxville. 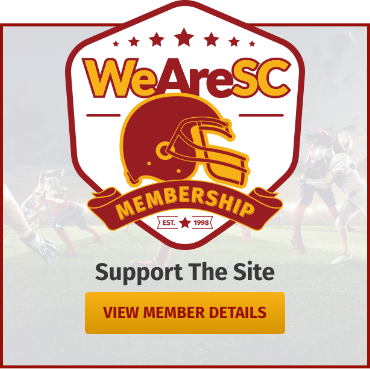 Jones is still on the NCAA Transfer Portal list and is still listed as a USC Trojan. It figures a decision is near. The possible transfer: The continuing destination saga of junior wide receiver Velus Jones has seen the Trojan junior, a NCAA Portal Transfer, visiting the University of Tennessee this weekend, and it should be noted that’s where former Trojans’ wide receiver coach Tee Martin now resides. By making the trip to UT, it would appear that Velus would now be considered unlikely to return to Troy. The Transfer Portal: With a trio of former Trojan Transfer Portal recruits having made their future destinations known, there’s still a couple of former Trojans like former S Ykili Ross, and WR Josh Imatrobhebhe still keeping their future college announcements close to the vest. Portal destinations: As a summation, former Trojans that have taken advantage of the NCAA Transfer Portal include WR Bru McCoy (Texas), S Bubba Bolden (Miami), WR Randall Grimes (Minnesota), LB Levi Jones (NC St.), and DE Oluwole Betiku Jr. and Trevon Sidney (Illinois). Sidney announced on Sunday he has committed to Illinois. 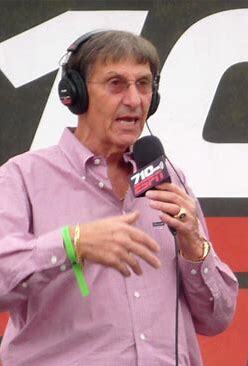 You’re on the air: A special thank you to popular sports radio personality and former UNLV head college football coach Harvey Hyde for inviting us to participate in his well-received “Trojans Talk” radio show heard on Thursday evening and Saturday mornings. Amongst an audience die-hard Trojan fans, the entertaining and enthusiastic broadcast originates from Settebello’s Italian restaurant on Colorado Blvd. in Pasadena. 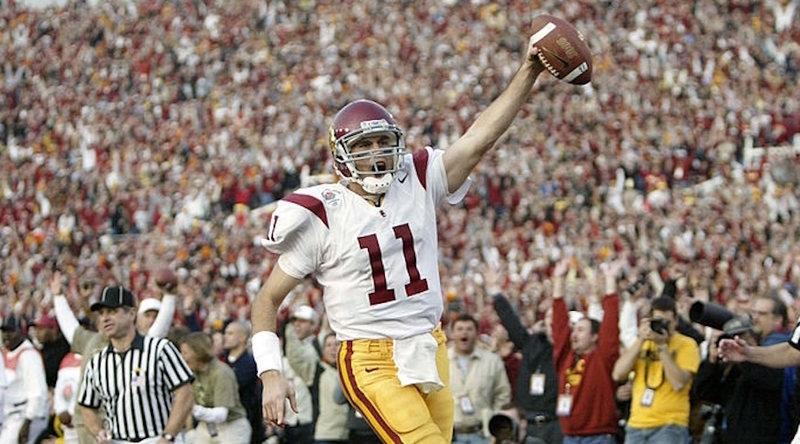 FYI, Settebello is owned by former USC quarterback Brad Otton. Thanks again, Coach Hyde. Scouting report: Next Saturday (April 20), the Pac-12 Networks will televise the following spring practice games: Oregon State (11 a.m.), UCLA (11 a.m.), Washington State (1 p.m.), Oregon (2 p.m.). Check your local schedules for time conflict games. All times are PDT. In memory: Pete Adams, one of the great offensive tackles in USC Trojans football history and a 1972 All-American who played in the NFL, recently pass away unexpectedly. A special celebration and memorial for Pete will take place this Saturday, April 20th, at 2:00 PM at the Elks Lodge in Cardiff (1393 Windsor Road, Cardiff, CA 92007). The lodge number is 760-753-2243. Dress is business casual. 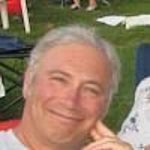 In memory – Part 2: Pete Adams, who was the linchpin of Coach John McKay’s 1972 offensive line, which included the likes of guards Allan Graf and Mike Ryan, center Dave Brown and tackles Booker Brown and Allen Gallaher. McKay’s 1972 national champions are arguably considered the greatest college football team in history. For the record, Pete Adams was on the national cover of the 1972 Street and Smith College Football Yearbook, a tremendous honor for an offensive lineman. 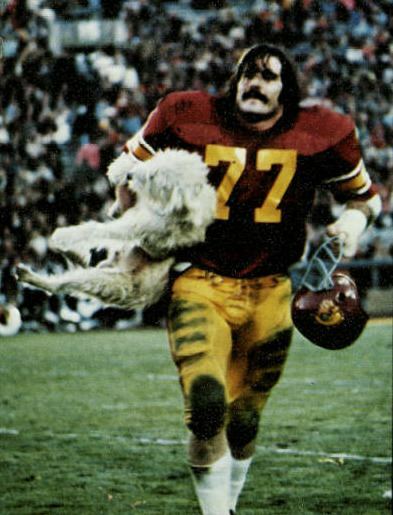 Here is the late Pete Adams, USC’s 1972 All-American offensive tackle, with his beloved dog, Turd. Turd was considered part of the 1972 national champion Trojans and was a fixture at both Trojan practices and games and was even beloved by USC’s legendary and Hall of Fame head football coach John McKay. In memory – Part 3: Pete Adams, who had huge hands, was a nasty player but had a soft side, especially when it came to his dog. At the time, media referred to the dog’s name as Turk, but in reality, his name was Turd. A native of San Diego, Adams came to the Trojans after transferring from San Diego City College. FYI, Pete attended San Diego University High. The last word: Still waiting: Does the new Coliseum’s name for 2019 still remain in place, so help me United Airlines Memorial Coliseum? BTW, the Coliseum is still in the city of Los Angeles, right?